One of my favorite aspects about living in Colorado is the ability to share it with others. Sometimes, the fun of the Life Bus is waiting at the stop for someone else. 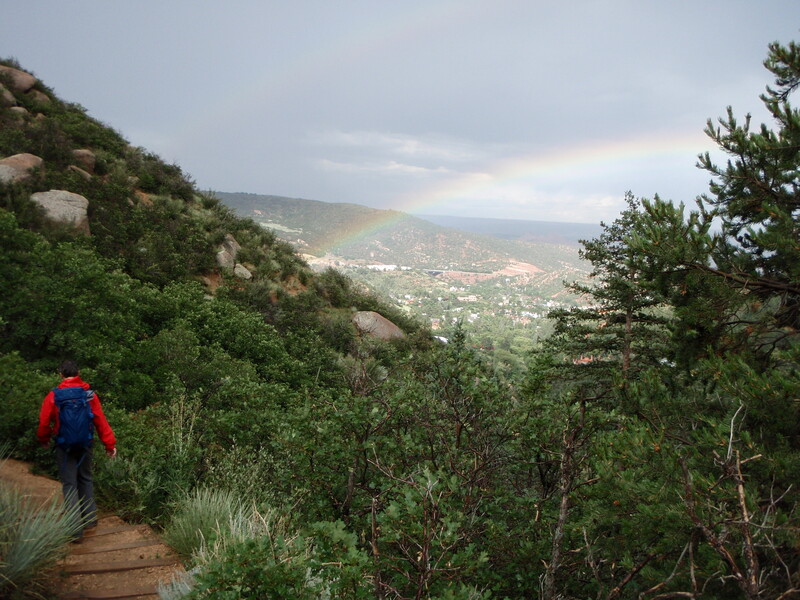 When I first moved to Colorado, my friends lovingly (I think) referred to trips here as “Lynda’s Boot Camp”, as my enthusiasm often overrode our abilities and we’d wind up the week, exhausted but blissful in our fatigue. In August, a friend from France came out for a few days to experience the Rocky Mountain high. There is a certain kinship between France and Colorado, with the passion for the mountains, trail running, skiing, cycling, and pretty much any outdoor adventure. I have many friends who had made the trek to France for all of these adventures, so I was excited to share Colorado with someone who would appreciate it as I do. He had sent me his dream itinerary and I did my best to adhere to it, but I had to throw in a couple of little known Colorado treasures as well. I didn’t know much about Colorado when I first moved here, but what I knew was also what he had heard as well. The 14ers, the big ski resorts, the famous I-70 and its Eisenhower tunnel. It was a chance for me to play tourist without my friends mocking me for doing so. We started our adventure on Pikes Peak. Two of his heroes–Killian Journet and Sebastien Chaigneau, both ultra runners–had completed the Pikes Peak marathon. Since this was one of his first days in Colorado, I opted for the Cog Rail to the summit and an easy hike down, knowing well the ill effects altitude can have on the uninitiated. And also it is a great way to get some of the history of Colorado. Zebulon Pike actually never summited the mountain named after him–in fact, he was famous for writing that he believed no one would ever summit the massive peak. See what doubt and disbelief will get you? The man who did originally summit it, Edwin James, now has a lower peak named for him. My favorite part of the ride is seeing one of the oldest bristlecone pines–some over 2000 years old. There’s a song a friend of mine sings that always ends up on my lips whenever I think about these ancient, gnarled and majestic icons. Asleep at the feet of the bristlecone pine. At the summit, we enjoyed the famous Pike Peak doughnuts–a delectable blend of fat and sugar (is there any better blend?) before beginning the journey back down. I was a little nervous because of the lateness of the time and the clouds already starting to form. I knew, though, that treeline wasn’t far below and the cover afforded a little more safety. We did get a bit of thunder and lightning but escaped unscathed. It was a beautiful 13 mile hike, and I was reminded that downhill is not necessarily easier than uphill. It was with no little relief to sit in the car after the seven hour round trip. While strong in my mountaineering skills, I found I was sadly lacking in the basics of survival, and my poor French friend was constantly having to remind me to feed him. Before leaving Manitou Springs for the next day’s adventure, dinner was at the Marilyn diner, famous for photos of the iconic star and excellent pizza. The next day was a selfish one, but it fit in perfect with the itinerary and route, so I went with it. 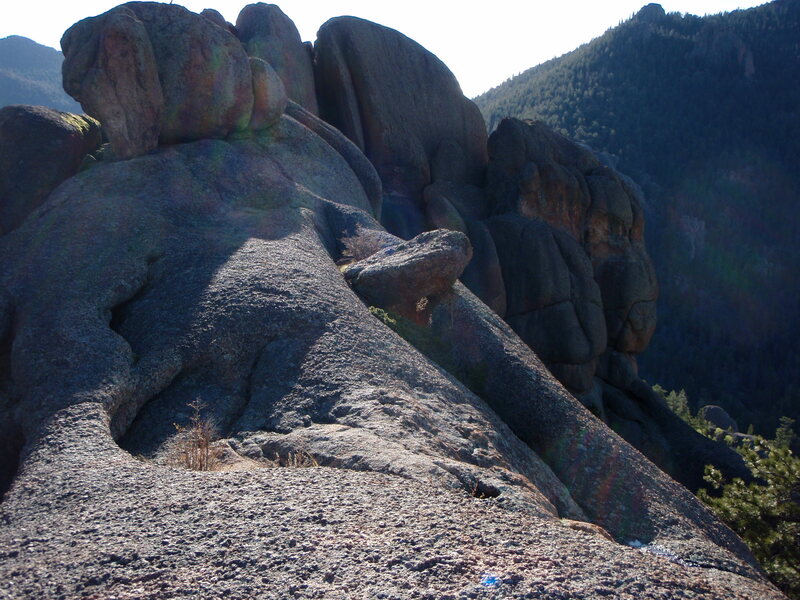 My favorite hiking area in Colorado is the very little known Lost Creek Wilderness. Every hike is more than a few miles and no summit has a trail to it. Add to that the fact that no peak is over 13,000ft, and it’s not terribly popular with the peak bagging crowd. Unlike many wilderness names, there actually is a lost creek. It is a perennial creek that disappears and reappears before finally uniting with Goose Creek. The rock formations is what makes it truly magical though, granite arches and domes filling the landscape like nowhere else in Colorado. I spent my entire birthday weekend here and was happy to return. I made it a short day so that we could resume his itinerary. The next stop was Ouray, home to the infamous Hardrock 100, arguably the most challenging one hundred mile foot race in the world. Heck, just getting in is more than most people can do. With three Colorado 100s under my silver belt buckle (the finisher award for 100s), I don’t even qualify to sign up for the lottery. Not just one hundred miles of running (in the loosest sense of the word), it boasts over 30,000 ft of elevation gain and a high point of 14,048. 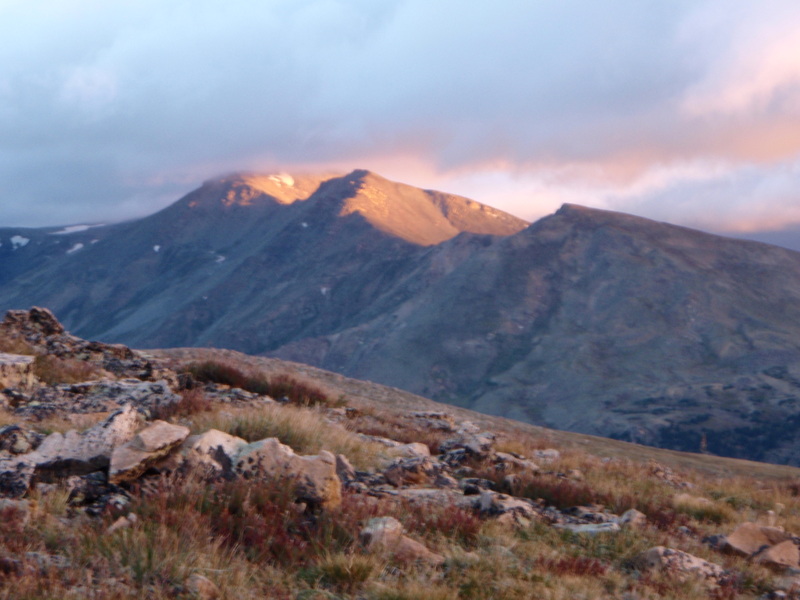 Yes, you get to climb a 14er in addition to everything else. Before we could get there though, we ran into a snag–welcome to the world of road tripping. For the past couple years, Colorado has hosted a pro-cycling tour, and on this particular day, its route coincided with the current destination. Not ones to let a little detour ruin the day, we watched in impressed fascination as the cyclists rode by. The year before, they had ridden Flagstaff Hill in Boulder–their speed up far surpassed mine going down the same hill. The detour added a couple of beautiful hours of travel to the day. I had never been down this particular road, and I found myself blissfully distracted by the canyons and rolling hills, accentuated by the storm clouds and sunshine casting an amazing lighting across the landscape. With a very wet summer, Colorful Colorado was living up to its name, with the greens and reds of brush and rock dotted with the purples and yellows of wildflowers. It seemed like no time before we were in Ouray, and the hot springs felt even more delicious than usual to my cramped body. I had even planned a dinner for that night at the Beaumont Grill, a distinctly Colorado restaurant with such delights as Colorado lamb and Rocky Mountain beef tips, hold the Rocky Mountain oysters. A good glass of wine, and the dust of the road was washed away. The last time I’d been on the trail we ran, witnessing a small avalanche roll across the trail was enough to convince me to turn around. This time, the narrow, rocky trail was clear, but still a little unnerving. It was built right into the side of the mountain during the mining days, and there was not much between you and the thousand foot drop. Given my inability to walk a straight line after about 40 miles, I could see Hardrock ending very badly for me. That section fortunately did not last long, and we were in the wildflower strewn meadow, enjoying a now very relaxed run. That afternoon was the biggest risk of the trip in terms of disappointment: a French winery in Colorado, Maison la Belle Vie, house of the beautiful life. Actually Australian and French, I’d discovered it on an earlier adventure to Palisade when I had had some time on my hands to explore the little town. There are many wineries there and all of them are welcoming, ready to tell you about the fun and challenges of wine making in Colorado and about how their life journey had brought them from all over the world to here. I was a club member at this particular winery, having purchased way too many bottles already, and I thoroughly enjoyed being able to select from the exclusive wines each time I came. Fortunately, the wine was well received and we left with a couple of bottles to share over the next few days. A short night in Fruita (dinner at the Hot Tomato–I wouldn’t let starvation win just yet), and we were off to the next stop: Aspen. Not a place I much frequent, given my limited salary, but it is home to another French hero: Lance Armstrong, seven time winner of the Tour de France, depending on which side of the drug argument you fall. I had rented two bikes for a ride up the infamous Independence Pass. The weather had been slowly deteriorating all week and today was overcast and drizzling. It would not be a long bike ride but at least the weather was allowing us a chance. I wasn’t keen on coming down the steep, occasionally rutted road in slick conditions on an unfamiliar bike. Most of the ride is in the aspen forest, beautiful and lush and different from the vast views of the previous days. The slow pace up, like that of trail running, allowed time to appreciate the surroundings. I pointed out the previous residence of Harrison Ford, a fellow search and rescuer: I have often dreamed of requiring a rescue in the wilds of Wyoming, Mr. Ford’s current home. During the descent, I worriedly studied the clouds. 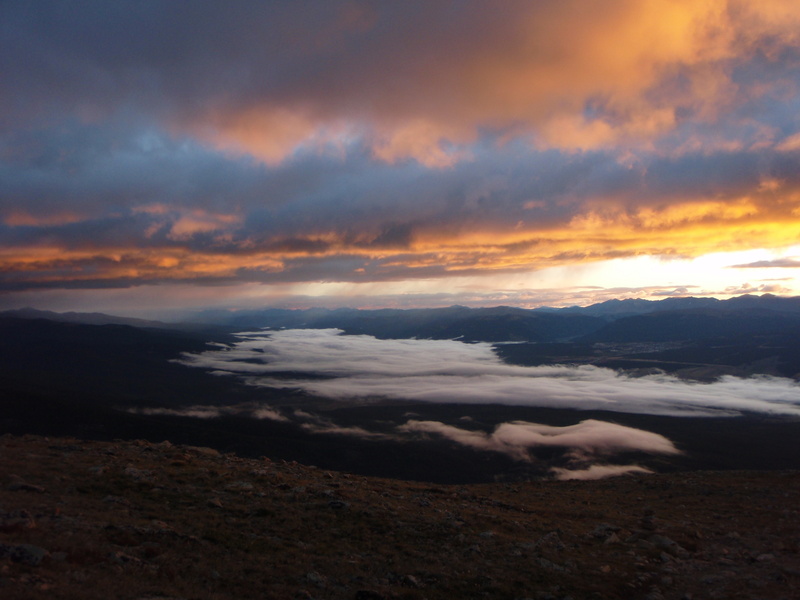 The next day was the grand finale, a hike up Mt Evans, the highest peak in Colorado. I wanted perfect weather for it, but that was quickly becoming not likely. I didn’t have a backup plan. Leadville, the nearest town, did not have many indoor activities for tourists, even counting the Mining Hall of Fame. There were the Cottonwood hot springs, but my French companion had not seem particularly enthralled by the ones at Ouray. I called on the words a climbing partner once said to me: You gotta at least try. So I drove to my favorite camping spot and prepared for the worst. My French penpal had often sent me photos over the months of castles where he had spent resplendent evenings. I felt not a little twinge of inadequacy in setting up the rented tent that would be our abode for the night. In the rain. We had at least stocked up on some finer snacks in Aspen, so dinner was a festive affair, with wine, cheese, crackers, olives, and other such goodies. Another difference between France and Colorado is the timing of hikes. The French do indeed schedule their lives around meals, mainly leaving the afternoons open for their hikes. With four thousand feet of elevation gain in under six miles, Mt Evans was no small hike, and with the unstable weather, I wanted off the mountain before any heating could give rise to thunderstorms. So it was with a bit of grumbling that we set off at 4am for the summit. Under the light of the headlamps, I warned him again that the summit was optional. Progress was slow and steady. We entered the clouds around 13,500 and enjoyed the novelty of snow in August even if the view was diminished. But the weather held steady, with not even a hint of thunder, so we continued our progress up, stopping when the sun made a particularly grand entrance into the Twin Lakes valley. The summit was completely clouded in, so we didn’t stick around long to enjoy our success. Summit photos were quickly taken and we headed back down. Once back in the sunshine, we took a break to eat leftovers. My search and rescue brain took over as I pointed out some of the dangerous habits of people heading up the mountain: cotton t-shirts, no packs, light jackets, small water bottles. One gentleman was even hiking in cowboy boots–I had to give him grudging respect as they just did not look comfortable for hiking. Back at the airport all too soon, I received a bisou (kiss) from my French adventurer, with a promise of equally and greater adventures when the Life Bus makes its way to France.